Stars of fashion, music, comedy and tv have come together to raise awareness of bear bile farming in a project they’re calling #BearRelief. It’s a name inspired by animal welfare charity Animals Asia's t-shirts that demand Let a bear sh!t in the woods – a call to end bear bile farming. 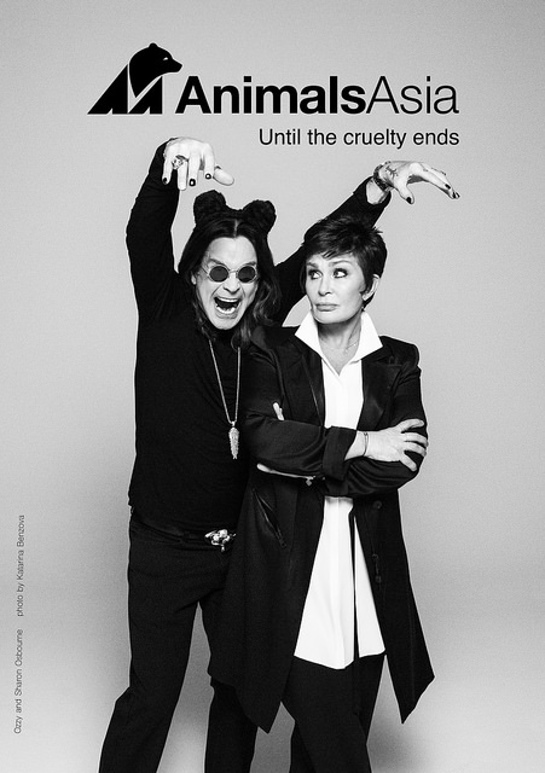 The stars involved include Sharon and Ozzy Osbourne, Simon Le Bon, Anthony Kiedis, Moby, Duff McKagan, and Steve-O, who feature in a print campaign of stunning black and white photographs shot by rock photographer Katarina Benzova. Many of the famous faces feature in an accompanying tongue-in-cheek film directed by Shaina Danziger, which also includes acclaimed actor/comedian Matt Lucas. The campaign launches internationally on May 13, with the big reveal celebrated at an exclusive NYC party on May 18. Other stars who have also given their support to Animals Asia include Ricky Gervais, Olivia Newton-John, Ali MacGraw and Jimmy Page. Animals Asia works in China and Vietnam to highlight the issue of bear bile farming. In China over 10,000 bears are in bile farms where they face excruciating bile extraction on a daily basis for use in traditional medicine. In Vietnam there remains over 1,200 bears being farmed. Alongside raising awareness of the bears’ plight, Animals Asia has rescued over 500 bears who it cares for in sanctuaries in China and Vietnam. Supporters are being asked to visit the website www.bearinthewoods.org to pledge their support to end bear bile farming.